Done! And I have to agree it's a very interesting article. Hi, sorry for the very late reply, I came down with the flu. So pilot wave theory is an example of a hidden-variable theory. Hidden-variable theories share the core idea that the randomness in quantum mechanics is not really randomness but instead a deterministic hidden variable that we cannot measure. There are two classes of hidden-variable theory; local hidden-variable and non-local hidden-variable. Local hidden-variable theories have the added requirement of local realism. Simply put this means that these theories require distant events (i.e. separated by some distance) cannot communicate instantaneously. As this class of theory is very sensible, they used to be very popular amongst physicists. So what happened? Bell wrote Bell's theorem which simply states "No physical theory of local hidden variables can ever reproduce all of the predictions of quantum mechanics.". This theorem has been proven. So that leaves us with non-local hidden variable theories, which includes the modern version of Pilot wave theory, called De Broglie-Bohm theory. This is a valid interpretation of modern quantum mechanics (along with the many-worlds interpretation, Copenhagen interpretation, modal interpretation and objective-collapse interpretation) that has plenty of weirdness of its own. The wavefunctions given by this theorem have hidden variables that can depend on the state of the entire universe. Furthermore, the pilot waves of this theory are by themselves sufficient to explain the behaviour of particles. So once again you end up describing particles as waves, just pilot waves. However, there are definitely physicists that argue for this view (and for any of the other views that I mentioned) but in the end they all produce the same results. We do know, we just can't create an analogy to more everyday things. Next time I will elaborate on the model we currently have. It can go from its base state (state 1) to a higher energy state (state 2) by absorbing a photon that would put in a third even higher energy state (state 3) and then reemit a photon that has an energy equal to the difference between the second and third state. This way it ends up at state 2 even though the photon didn't have the energy to fit the transition from 1 to 2. If the photon does not fit the electron's needs it will not interact with the electron. So it will not be absorbed. In essence you are correct. Light that is too low frequency to allow the electron to escape will instead only bring the electron into a higher energy level within the metal. If it would then absorb a second photon it could escape (or maybe it needs a third, fourth, etc). However, there are several rules that make this very tricky to achieve. The energy of the photon must be exactly the energy difference between the energy level the electron is in and another allowed energy state. Remember, this is quantum mechanics so the electron can only have certain discrete energies. If the photon's energy doesn't match this energy difference nothing happens. Say we manage to do this, then we have to get lucky and absorb a second photon before the electron falls back into its original state (and re-emits a photon). The average amount of time an electron spends in the higher energy state is called the lifetime, and it's usually very short in these cases. If it needs more than two photons worth in energy to escape it becomes even trickier. Say it absorbed one photon. Then it gets lucky and comes into contact with another photon that has the same energy. Just because the photons have the right frequency to help the electron go from its original state to the state it's currently in, doesn't mean the same energy can bring it into an even higher state. Energy levels are rarely evenly spaced. So I did lie a little bit, you could - if you have the right set of frequencies in your light that can help the photon raise its energy in steps - see a few photons being emitted but it would be very rare compared to what happens when you have the frequency that can punch out electrons in a single step. It's the difference between winning the lottery once and winning it twice within a short time span (the lifetime of the electron in the higher energy state). I want to give an introduction on several physics topics at a level understandable to laypeople (high school level physics background). Making physics accessible to laypeople is a much discussed topic at universities. It can be very hard to translate the professional terms into a language understandable by people outside the field. So I will take this opportunity to challenge myself to (hopefully) create an understandable introduction to interesting topics in modern physics. To this end, I will take liberties in explaining things, and not always go for full scientific accuracy, while hopefully still getting the core concepts across. If a more in-depth explanation is wanted, please ask in the comments and I will do my best to answer. Today's topic is the dual nature of light and matter, the wave-particle duality. It is a central concept in quantum mechanics that - as is tradition - violates common sense. I will first discuss the duality for light and then, in the next post, for matter. In what terms can we think of light so that its behaviour becomes understandable to us? As waves? Or as particles? There are arguments to be made for both. Let's look at what phenomena we can explain if we treat light as a wave. Let's start with an analogy. Drop two stones in a pond, imagine what happens to the ripples in the pond when they meet each other. They will interact, when two troughs meet they amplify each other, forming a deeper trough. When two crests meet they do the same. When a crest and a trough meet they cancel out. Now if we shine light through two small openings and observe the resulting pattern, we see it's just like ripples in a pond, forming an interference pattern. When looking at the pattern formed on a screen placed at some distance from the openings, we see a striped pattern Light can be described as an electromagnetic wave, with crests and troughs. It sure seems like light is wavey! The wave nature of light allows us to describe phenomena like refraction and diffraction. When we shine light on some metals, they will start tossing out electrons. This is called the photoelectric effect. How can we understand this process? Well we know light is a wave, so we imagine that the wave crashes into the electron that is chilling out near the surface of the metal. Once the electron has absorbed enough of the light's energy it will be able to overcome the attractive forces between itself and the positively charged atom core (remember, an electron has negative charge and so is attracted to the atom cores). So a higher intensity of light should make the electron absorb the required amount of energy more quickly. Easy, done! However, there's something very peculiar going on with the photoelectric effect. If we shine low frequency light on said metal, no matter how intense the light, not a single electron will emerge. Meanwhile if we shine very little high frequency light on the metal, no matter how low the intensity, the electron will emerge. But how can this be? A higher intensity of light should mean the electron is receiving more energy. Why does frequency enter into this? It seems that the electron needs a single solid punch in order to escape the metal. In other words, it seems it needs to be hit by something like a microscopic billiard ball that will punch it out of the metal in one go. The way physicists understand this is by saying light is made up out of particles called photons, and that the energy a photon carries is linked to its frequency. So, now we can understand the photoelectric effect! When the frequency is high enough, the photons in the light beam all individually carry enough energy to convince an electron to leave the metal. When the frequency is too low, none of the photons individually can knock an electron out of the metal. So even if we fire a single photon, with high enough frequency, at the metal we will see one electron emerging. If we shine low frequency light with a super high intensity at the metal, not a single photon will emerge. So there you have it! Light is made out of particles. Wait, what? You just told us it's made out of electromagnetic waves! So, maybe light is just particles and the wave are some sort of emerging behaviour? This was a popular idea, one that Einstein held for some time. Remember the experiment where we shone light through two small openings and saw interference (commonly known as the double slit experiment)? Let's just take a single photon and shoot it at the openings! Because light is particles we'll see the photon just goes through either opening - like a particle would. Then all the non-believers will have to admit light is made out of particles! However, when we do the experiment we see the photon interfere with itself, like it was a wave. Remember this picture which we said was due to wave interference of light? 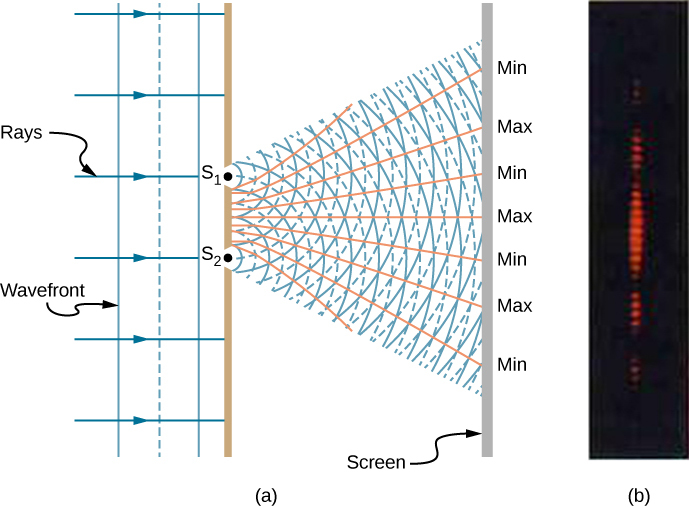 When a single photon goes through the openings, it will land somewhere on the screen, but it can only ever land in an area where the light waves wouldn't cancel out. 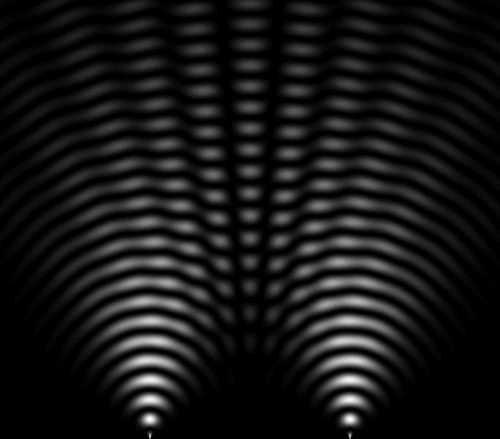 If we shoot a bunch of photons through the openings one at a time, we will see that the photons create the same pattern as the one we said is due to wave interference! So it would seem light acts like a particle in some cases, but it acts like a wave in some others. Let's take a step back and question these results. Why are we trying to fit light into either description? Just because it's convenient for us to think about things like waves and particles - we understand them intuitively. But really, there is no reason nature needs to behave in ways we find easy to understand. Why can't a photon be a bit wavey and a bit particley at the same time? Is it really that weird, or is it just our intuition being confused by this world we have no intuitive experience with? I would love to hear your opinions in the comments! To add one final helping of crazy to this story; if we measure the photon's location right after it emerges from the slit we find that it doesn't interfere with itself and that it just went through a single slit. This links back to my previous post where I described superpositions in quantum mechanics. By observing the photon at the slits, we collapsed its superposition and it will behave as if it's really located at one spot, instead of being somehow spread out like a wave and interacting with itself. The self interaction is a result of its wavefunction interacting with itself, a concept that I will explain in the next post. We learned that light cannot be described fully by treating it simply as a wave or simply as a bunch of particles. It seems to be a bit of both - but neither - at the same time. This forces us to abandon our intuition and accept that the quantum world is just fundamentally different from our every day life. Next time we will talk about the dual nature of matter and try to unify the wave and particle descriptions through a concept known as the wavefunction. As usual, please let me know where I missed the mark. Also let me know if things are not clear to you, I will try to explain further in the comments! The photoelectric effect is actually what gave Einstein his Nobel prize! Although he is famous for his work on relativity theory he was very influential in the development of quantum mechanics too. An interesting aside on phase changes is that the theory is used much more widely than to just explain the form matter has when you heat it. The same theory can be used to, for example, describe how materials magnetise (go from non-magnetic to magnetic) and how they go from normal conductivity to superconductivity. The theory of phase changes and thermodynamics has its power in the fact that it can describe systems without knowing exactly what those systems are and therefore has been able to stay relevant throughout the quantum revolution of physics. Quoting myself from elsewhere in the thread: I think that should answer the question. If not, please let me know! So to create the photons we need the electrons to drop in energy. In order to explain this properly I'll first have to introduce a few more concepts. A semiconductor has 2 energy bands, the conductance band and the valence band. If an electron has a high enough energy it will end up in the conductance band and be able to, well, conduct. If it doesn't have the required energy it ends up in the valence band where it's stuck being unable to move. Crucially, in semiconductor there's a gap between these two bands; the bandgap. What this means is that electrons cannot have an energy that falls within this gap. So, now back to the junction. The two materials making up the junction do not have their valence and conductance bands at the same energies. The p-type's conductance band will start at a higher energy than that of the n-type. This means that an electron that flows into the barrier will end up in one of two scenarios. If it has enough energy to end up in the n-type's conductance band it will continue flowing. Otherwise, if it has enough energy to be in the p-type's conductance band but not in the n-type's, it is forced into valence band of the n-type. This means it will have to drop in energy - else its energy would end up in the band gap - and while doing this it will emit a photon. This is how the junction forces the electron to emit a photon. I think that should answer the question. If not, please let me know! Also what do you mean by electrons interacting with phonons but not creating phonons, and how does the junction play a part in this? What your previous comment seemed to imply is that you think electrons go bouncing around creating phonons. However, they usually just scatter off of phonons, making them change directions elastically (without a change in energy). Phonon creation can also happen at a junction, as I discussed previously, when the material has an indirect bandgap. And what's the difference between crystal vibrations in the form of phonons compared to normal vibrations (like sound wave)? A vibration from sound wave can be modelled as a certain kind of phonon, an acoustic phonon (with infinite wavelength). That's a really cool idea. I hadn't considered it before. With current techniques we can create blue, green, red etc. LEDs but these are all made out of different semiconductors. So fusing them together into one diode is just impractical and would probably introduce secondary effects on the boundary between the materials. The emerging nanotechnology has brought a variety of new opportunities for solid-state white lighting research. In particular, semiconductor nanostructures, such as semiconductor alloy nanowires, have shown the potential in constructing white lighting sources due to their high quantum efficiency and wide band gap tunability. Using the vapor liquid solid (VLS) nanowire growth mechanism, the element composition in the grown nanowires can directly be controlled by the corresponding element concentration in the source materials or the precursor vapor, and semiconductor alloys with different band gaps can be gradually grown into single wires along their length, through applying an in situ concentration changing of the source reagents during the growth. These band gap graded semiconductor nanostructures offer the opportunity to design novel white light-emitting materials or structures at microscale from the ground up. Emphasis mine. It seems that the limiting factor here is how smoothly they can change the bandgap over the width of the material. Here's a photo they made of the nanowire they produced. That's a good question. For other readers; white light is a mix of different colours of light so as @Diff noted it would be impossible to create with a LED. There are two ways we can create white light LEDs, one is indeed to use multiple LEDs (RGB) and then mixing the light they emitted. However, this only produces the illusion of white light and not actually white light that has all the colours in it like the light from the sun does. This means that the colours of objects viewed in this light can appear off. A better way to produce white light is by taking just one blue or UV LED and letting its light fall onto a fluorescent material. This material will absorb the light and re-emit at lower frequencies. The frequencies of visible light are lower than that of UV (and blue has the highest frequency) so this way we produce a lot more colours of light. However, fluorescence is a quantum mechanical process too so it will not emit the full spectrum of visible light either. So if you need to be able to see all colours, sunlight or good old lightbulb light is still the best. That's a lot of classical analogies for an inherently quantum mechanical process. Note that having a junction between two materials is critical for light emission. The recombination of the holes and electrons is what drives the emission. Electrons just moving through a material will interact with phonons (the crystal vibrations) but they won't necessarily create phonons. The junction is needed to force photon or phonon emission. If you are nterested in more detail on how the junction is critical, I can try to explain. Very interesting question. To answer it I will first rephrase it. Why does the energy release result in photons, light particles, being released and not phonons? Phonons are """heat particles""", or more technically collective vibrations of the crystal. When an electron meets a hole and decides how to release the energy it needs to keep some things in mind. As I mentioned in the post, energy needs to be conserved. However, there is a second quantity that needs to be conserved as well. This is the so-called crystal momentum. Photons carry energy, but they cannot carry crystal momentum. Meanwhile phonons carry both energy and crystal momentum. In fact, a phonon must have crystal momentum to exist just like a photon must have energy to exist. For a LED to work it must then force the electron to lose energy but not crystal momentum; so that phonons cannot be created but photons can be created. This is exactly what happens in so-called direct bandgap materials (in fact we define this class of materials for having this property). If we created a LED out of an indirect bandgap material it would instead create phonons, as now the electron must also dump some crystal momentum when it goes across the junction, and this crystal momentum cannot go into a photon. As such calling such a device a LED would be a serious misnomer, it wouldn't emit any light but instead create phonons which we observe as heat. In fact, phonon-electron interactions are a source of "friction" for the electrons, reducing their ability to flow freely and as such reducing the material conductivity. This is why conductivity reduces as temperatures increase; there are more phonons hanging around at higher temperatures. Today's topic will be light emitting diodes, better known as LEDs. As the name suggests, we'll have to discuss light and diodes. We will find out why LEDs can only emit a single colour and why they don't get hot like other sources of light. Let's start by discussing diodes, in case you are already familiar with diodes note that I will limit the discussion to semiconductor (p-n with a direct bandgap) diodes as that's the type that's used in LEDs. A diode is an electronic component that, ideally, only lets electric current through in one direction. In other words it's a good resistor when the current flows in one direction and a really good conductor when the current flows in the other direction. Let's look a bit closer at how diodes function. Diodes are made out of two different semiconducting materials. In everyday life we tend to classify materials as either conducting (metals being the prime example) or non-conducting (wood, plastics, rubber). Conductance is the flow of electrons through a material, a conducting material has a lot of electrons that can move freely through a material while an insulator has none. Semiconducting materials fall in between these two categories. They do conduct but not a lot, so in other words they have a few electrons that can move freely. We are able to change a semiconductor's conductivity by adding tiny amounts of other materials, this is called doping. As an example, we can take silicon (the stuff that the device you're reading this on is made out of) which is the most well-known semiconductor. Pure silicon will form a crystal structure where each silicon atom has 4 neighbours, and each atom will share 1 electron with each neighbour. Now we add a little bit of a material that can share 5 electrons with its neighbours (how generous!). What will happen? Four of its shareable electrons are busy being shared with neighbours and won't leave the vicinity of the atom, but the fifth can't be shared and is now free to move around the material! So this means we added more freely flowing electron and that the conductivity of the semiconductor increases. An illustration of this process is provided here, Si is chemistry-talk for silicon and P is chemistry-talk for phosphorus, a material with 5 shareable electrons. This kind of doping is called n-type doping because we added more electrons, which have a negative charge, that can freely move. We can do the same thing by adding a material that's a bit stingy and is only willing to share 3 electrons, for example boron. Think for a moment what will happen in this case. One of the silicon atoms neighbouring a boron atom will want to share an electron, but the boron atom is already sharing all of its atoms. This attracts other electrons that are nearby, one of them will move in to allow the boron atom to share a fourth electron. However, this will create the same problem elsewhere in our material. Which will also get compensated, but this just creates the same problem once more in yet another location. So what we now have is a hole, a place where an electron should be but isn't, that is moving around the crystal. So in effect we created a freely moving positive charged hole. We call this type of doping p-type. Here's an illustration with B the boron atoms. So what would happen if we took a n-type semiconductor and a p-type semiconductor and pushed them against one another? Suddenly the extra free-flowing electrons of the n-type semiconductor have a purpose; to fill the holes in the p-type. So these electrons rush over and fill the holes nearest to the junction between the two semiconductors. However, as they do this a charge imbalance is created. Suddenly the region of p-type semiconductor that is near the junction has an abundance of electrons relative to the positive charges of the atom cores. A net negative charge is created in the p-type semiconductor. Similarly, the swift exit of the electrons from the n-type semiconductor means the charge of the cores there isn't compensated, so the region of the n-type semiconductor near the junction is now positively charged. This creates a barrier, the remaining free electrons of the n-type cannot reach the far-away holes of the p-type because they have to get through the big net negative charge of the p-type near the junction. Illustration here. We have now created a diode! Think for a moment what will happen if we send current* (which is just a bunch of electrons moving) from the p-type towards the n-type. The incoming electrons will face the negative charge barrier of the p-type and be unable to continue. This means there is no current. In other words the diode has a high resistance. Now let's flip things around and send electrons through the other way. Now they will come across the positive charge barrier of the n-type semiconductor and be attracted to the barrier instead. The electrons' negative charge compensates the net positive charge of the barrier on the n-type and it will vanish. This destroys the equilibrium situation of the barrier. The p-type holes are no longer repelled by the positive barrier of the n-type (as it no longer exists) and move closer to the junction, this means the entire barrier will fade and current can move through. We now have a conductor. Now let's find out how we can create light using this method. When current is applied to a diode what happens is that one side of the diode is at a higher energy than the other side. This is what motivates the electrons to move, they want to go from high energy to low energy. If the p-type semiconductor is at a higher energy than the n-type the electron will, upon crossing the junction between the two types, go from a high energy level to a lower one. This difference in energy must be compensated because (as @ducks mentioned in his thermodynamics post) energy cannot be destroyed. So where does the energy go? It gets turned into light! The energy difference between the p-type and n-type is fixed, meaning a fixed amount of energy is released each time an electron crosses the junction. This means the light is of a single colour (colour is how we perceive the wavelength of light, which is determined by the energy of the light wave). Furthermore, none of the energy is lost so there is no energy being turned into heat, in other words the LED does not get warm. So now we know why the LED is so power-efficient; it does not turn any energy into heat, it all goes into light. We now also know why they only emit a single colour, because the energy released when an electron crosses the junction is fixed. I think next time I will try to tackle the concept of wave functions in quantum mechanics. *) Yes, current flow is defined to be opposite to the flow of the electrons, but I don't want to confuse readers with annoying definitions. So say I have a simulation of an interacting particle system and it reaches equilibrium. I apply several dimensionality reduction techniques and find some eigenfunctions of the system (kind of like in this paper). Supposing they don't depend on the past states of the system, could I consider these state variables? I am not sure what you mean. You want to find state variables that can track a system's 'movement' through its phase space. So for each (macroscopic) degree of freedom you want to have a state variable. I am not entirely sure how the eigenfunction will help you here. I guess my other question is how do you decide a system has reached equilibrium, for example, a steady state would be an equilibrium but in ideal gases you still have the particles moving around. An equilibrium state is not the same as a state in which nothing is happening. Sure, an ideal gas has particles moving around but the power of thermodynamics is that we don't need to care. We look at the entire system and see no net changes in energy. There is no energy coming in, no energy going out. The gas' net energy does not change. So an equilibrium state is a state in which there are no net flows of energy (or matter, or whatever else is relevant). Is there any good book on the mathematical aspects of statistical mechanics and thermodynamics? I don't know any good books that work from a mathematical point of view. Most physicists prefer to learn by examining physical systems and so all the books I know of on statistical mechanics explain things by reformulating known concepts (quantum mechanics usually) in new terms. If you are familiar with quantum mechanics I can suggest a few books. Within the context of physics, a system is defined so that you can either keep a property constant, or so that you can track the influx (positive or negative) of a quantity. So that's what the starting point should be when you want to define a system in a useful manner; the quantity you want to track. I remember that a way to think about black holes radii, Hawking radiation, etc. (and do back-of-the-envelope calculations) was to define a temperature/energy/entropy for the black hole system. It was pretty cool but it was also not related to normal definitions (for example energy was related to the surface area of the event horizon). This is true, black holes can be described thermodynamically (the details are way out of my field though). I take issue with saying it's not related to normal definitions. Energy is still energy, it's just expressed in terms of surface area. So I wonder how do people go about defining these concepts and if it is possible to do so for every system or there are requisites for what a system must have in order to have thermodynamical properties. We must be able to define the system in terms of state variables (pressure, volume, etc). In physics, we look for the right state function (e.g. F(P,V)) to describe a system. Crucially, these state variables must only depend on the equilibrium states of the system. The way the system got the current state must not matter, only its current state. If you cannot describe your system within these constraints it's not a thermodynamic system. EDIT: many microscopic systems are non-equilibrium systems and therefore cannot be described by classical thermodynamics. There do exist theories for non-equilibrium many-body systems but I haven't dealt with them much. One book I have studied is field theory of non-equilibrium systems by Alex Kamenev which gets around the restrictions I described above by using time contours. This post contains all entries of the "a layperson's introduction to" series. I will keep this thread up to date and sorted. This means this post is an excellent opportunity to try out the bookmarking feature! Is that in reference to Susskind's theoretical minimum? Isn't that focused on the maths quite heavily? Thanks by the way. Is that in reference to Susskind's theoretical minimum? Isn't that focused on the maths quite heavily?